The story of the discovery of oil in Brunei’s oil town, Seria has often been told even in school text books but no body remembers how difficult it was to find oil in Brunei Darussalam at the beginning. When we look at the approximately 200,000 barrels of oil that our nation produced daily and the billions of revenues that we get from the sale of oil and gas, it is a wonder that it was ever found in the first place. By the early 20th century, Brunei, once a powerful regional thalassocracy (maritime power) had become a poor country. Brunei had lost almost all of its territories and was confined to the current tiny area in the vast Borneo Island. It needed something of a miracle and it found it when oil was discovered in Brunei and in particular in abundance where Brunei is currently. Oil has been more or less expected to be found in the North West Borneo area. By the mid 19th century, seepages have been reported in a number of places and oil prospectors have come in droves flooding in to Borneo and into Brunei all hoping to be the lucky person to find that oil. Oil prospectors tried drilling in a number of places. In Labuan, a hole was actually drilled there as early as 1866. In Brunei, an oil seepage was reported in the late 19th century. It was at a place called Ayer Bekunci near Kampung Kasat which is around the Sungai Kebun area in Kampong Ayer and just across the Brunei River from the capital, Bandar Seri Begawan, then known as Pekan Brunei. 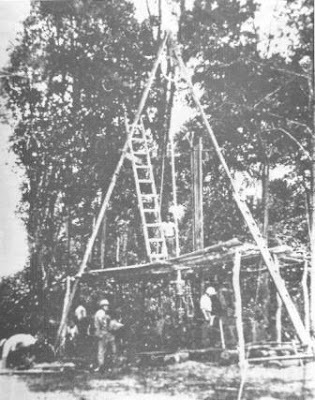 A well was drilled for the first time in Brunei in 1899. The drilling went down as deep as 850 feet but unfortunately no oil was discovered. After that attempt, interest in finding oil in Brunei waned. But that all changed when in 1910, oil was discovered in the neighbouring district of Sarawak, Miri. That renewed the flagging interest of discovering oil in Brunei Darussalam. In 1911, a geological survey for Brunei was conducted by the British Borneo Petroleum Syndicate Limited. A number of other companies were also given oil prospecting and mining rights to find oil in Brunei Darussalam. The British Borneo Petroleum Syndicate Limited was given 169 square miles in the Belait District. The Shanghai Langkat Company from Singapore was given a small area in Jerudong. The Nederland Koloniale Petroleum Maatschappij, a Dutch Company in the Belait District, The Anglo Saxon Petroleum Company Limited in the Tutong District and Asiatic Petroleum Company (Federated Malay States) Limited was also given rights. The latter two are Shell Group companies. All the companies mined between 1912 to 1923 and between all of them, in those 12 years, they only had one ‘oilshow’ (the character or traces of oil showing or present) but all the other oil wells in all the districts were dry. As a result most of them abandoned their operations with the exception of Shell. It bought the Petroleum Syndicate’s rights and from 1923 onwards, Shell began serious exploration works in the Belait District. Belait District, being the area adjoining the Miri District in Sarawak looked to be quite promising to Shell as it had already produced oil commercially there. However Shell did not have that much success in the beginning. In Labi, the British Malayan Petroleum Company (BMP), the Shell company drilled a few oil wells and one produced oil even though the amount was not of commercial quantities. Another produced gas at high pressure. It wasn’t until 1926 before the search for oil began in earnest in Seria. The story oft been told regarding the discovery was that a Mr. F.F. Mariott, then BMP’s Field Superintendent in Labi and and a Mr. T.G. Cochrane (later Lord Cochrane), then the General Manager of Sarawak Oilfields Limited, another Shell company were on the way towards Kuala Belait from Miri. They stopped at Kuala Balai, then considered as the capital of the Belait District and used two bicycles to visit a geophysicist in the Lumut area. It was a relatively long journey and they stopped at Padang Berawa, near Sungai Seria to rest. That was when Cochrane smelled oil and told the geophysicist to suggest the survey further south to Padang Berawa. At that time Padang Berawa (wild pigeon’s field) was unknown and was described as a swamp and the conditions in that area was terrible. However a number of gas seepages were reported and when analysed at Shell Headquarters in Holland indicated that it was methane and ethane gas indicating the possibility of oil gas. A detailed survey was conducted and coreholes were drilled. 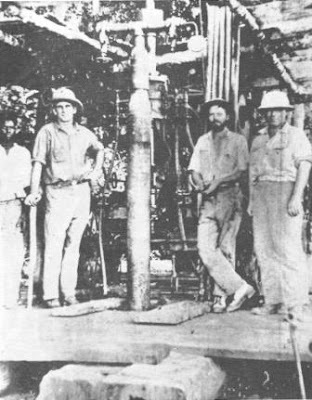 The first proper oil well named S-1 was drilled in July 1928 near the beach and struck oil and gas at 974 feet when it began flowing. And the rest is history. Padang Berawa as a name disappeared from the records and Seria named after Sungai Seria became the new name for the newly created town. It took quite a while before Seria was established. In the early days, all equipment had to ferried in. The first buildings were relatively primitive. It wasn’t until 1938 that the road connecting Kuala Belait and Seria was completed. Before that, one had to drive along the beach and wait for the tides to go out. It was the same from Seria to the capital. It wasn’t until the early 1960s that the road from Kuala Belait to Bandar Seri Begawan (then Pekan Brunei) was finally connected. As a side note, it is interesting to note that the company name ‘Shell’ was not visible in all the early Shell companies that operated in Brunei. The discovery of oil in Seria was made by a Shell company called Sarawak Oilfields Limited and the oil production was operated by another Shell company called British Malayan Petroleum Company Limited. The Brunei Shell Petroleum Company Limited did not operate until 1957.